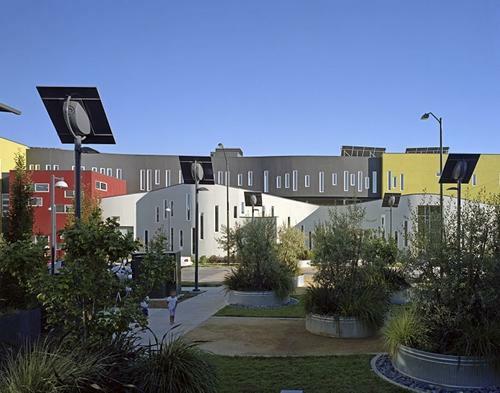 Affordable housing in Oakland goes solar | West Coast Solar, Inc.
A recent piece published on OaklandLocal.com draws attention to a recently rebuilt affordable housing development that has earned praise from environmental and public housing advocates. Tassafronga Village in Oakland was originally built in 1964, but over the years had become a dilapidated housing project that fell into disrepair and posed a public health risk. Some of the structures were cracking and presented a seismic hazard, while the soil had become contaminated with petroleum and pesticides. However, Tassafronga was recently torn down and rebuilt into an innovative green community with mixed-income housing, at the center of which is an array of solar panels delivering clean energy to the complex’s residents. Because the community was switched to solar, residents of Tassafronga typically pay between $10-15 a month for their electricity. This is a significant development, because low-income citizens typically spend approximately 400 percent more of their income on energy expenses than the average American. In addition, apartment buildings that were constructed before 1970 – which account for much of the public housing stock that is currently available – use 55 percent more energy than private homes. Although some cities have succeeded in creating low-income housing projects for those who need them, they’ve been less successful in developing affordable energy policies to complement those programs. Tassafronga shows that it’s possible to wed the objectives of creating affordable housing and integrating more solar energy solutions into the grid, creating communities that are green and accessible at the same time. To learn more about public policies and financing programs that can help residents convert to solar energy, give West Coast Solar a call today.